So you want to learn how to improve your memory, learning of a new memory techniques, get awesome grades & pass exams with ease? If you answered OH YES to the question above, then today is your lucky day. Many experts offer expensive courses, student seminars, and books dedicated to the topic of “improving your memory”. Well, I’m about to tell you how to help yourself to your best performance in exams, and it’s FREE! If you’re worrying that free advice is often overpriced, reassured! What I’m to tell you comes from decades of research on learning and memory conducted by some of the most influential scientists of our time. For those looking for tips on how to study for exams memory improvement techniques is a good place to start. Let’s face it if you are preparing for an exam there is a lot of information that you will need to commit to memory in order to make a pass mark. One of the keys to a good memory is to practice memory techniques regularly. We all at some point in time need to memorize a number of things in our daily life. Having certain memory enhancement techniques to help you better memorize things can certainly be useful. Techniques on how to improve your memory can be traced back to the Ancient Greek Scribes. They needed to memorize lengthy poems so they used a technique referred to today as chunks. Basically you group similar information into groups or chunks and then visually associate the chunk with some cues that you have learned earlier. The Romans used another memory techniques called The Memory Palace Techniques. Basically this method uses places you are very familiar with and associates them with mental concepts. This is a very powerful combination that works quite well. Using this method will help you retain what you have memorized for many days, weeks or even longer. These great memory techniques are awesome tips on how to study for exams. They would definitely help you to at least achieve a passing grade. The more you practice these techniques the faster and better you will learn them. Some people learn by visual and some people learn from audio and some people learning by actually doing things. Of course most people learn by a combination of all three. For example a person who learns and memorizes visually may write something down many times and this enables them to commit this information to memory. A person who learns things using the audio format may play the information over and over and eventually will b e able to commit that information to memory. An good example of audio learning would be listening to a song and learning the lyrics. The third way of committing something to memory is to actually do it. For example I want to learn how to bake a cake. I read the directions but don’t quite understand them. Someone explains it to me and I still do not get it. So what do I now do? I get the cake mix and I start making the cake. I may not beat the mix long enough so the cake comes out lumpy but I have learned from that experience and now I will commit that to my memory. Instead studying at late night, get early in the morning as early as possible. Do not exercise in the morning – morning walk, yoga etc. Regular, deep and continuous sleep is very essential. Controlled use of TV, Internet, Mobiles, Games etc. So which way is best for you when you are trying to remember things? 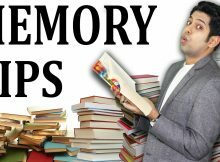 When you are presented with different tips on how to improve your memory especially when it comes to preparing for exams knowing which one is best for you will help you greatly to achieve good grades. How to Improve Your Memory: Get Awesome Grades & Pass Exams With Ease. Click here to unlock the secret!